For perhaps obvious reasons, Gerald picked up the nickname 'Jesse' long before his show business career began. After leaving school, young 'Jess' had a variety of jobs before finally managing to get a part as a film extra. He then decided that acting was what he wanted to do and after a period in repertory, during which he made the final adjustment to his stage name, he secured a part in a TV series that would change his show business direction. In 1959, Jess Conrad was a strikingly good looking young man which made him a natural choice for the starring role of Barney in a play called: 'Rock-A-Bye Barney', which was about a rock and roll performer. The EP illustrated here contains none of Jess' hit recordings, but relates more to his acting career which possibly makes it more interesting. 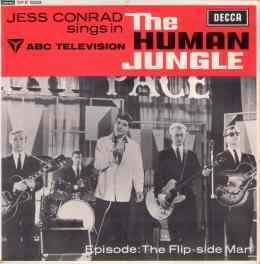 The 'Human Jungle' was a weekly TV drama featuring Herbert Lom in the role of resourceful psychiatrist Doctor Corder. The second episode of the series was based on the problems of a rock and roll star Danny Pace played by none other than Jess Conrad. DFE8524 contains four numbers specially recorded for the programme. Jess is supported well by Rhet Stoller and his group who provide a first class backing. It was Jack Good that spotted the potential of a pop record issued by the young actor and Jess Conrad was encouraged.to go into a recording studio- even though singing could not have been considered as one of the actor's strong points. The song chosen for his first recording- a cover of Skip And Flip's US hit, 'Cherry Pie' did not demand a greater singing ability than Jess could provide and it did enough to get the actor recognised as a pop artist. 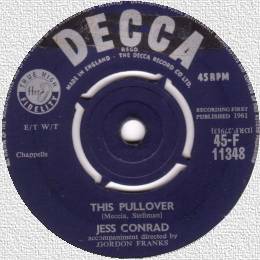 The new singer's next offering, published during the autumn of 1960, did nothing at all and it looked as though Jess's chart career might already be over. However, his third release 'Mystery Girl' proved to be ideally suited to Jess Conrad's unpretentious vocal style and February of 1961 found him in the UK Top 20. Jess managed to scrape into the top 50 with one more single during the autumn of 1962 and then his chart career was at an end. Apart from 'Mystery Girl' his most publicised single is probably 'This Pullover', a record lampooned by the late Kenny Everett and regularly found in 'Worst Records Of All Time' listings- a notoriety that has not made it less collectable! Jess Conrad's excursion into the world of pop music did not end there, though he returned to acting, and in that role he has subsequently made very many stage, TV and movie appearances. Ever since his chart days, he has regularly taken opportunities to sing 'Mystery Girl' at cabaret and 'rock and roll' revival concerts, and still does so. Decca DFE6666 1960 "Jess Conrad"
Decca DFE6702 1962 "Twist My Wrist"